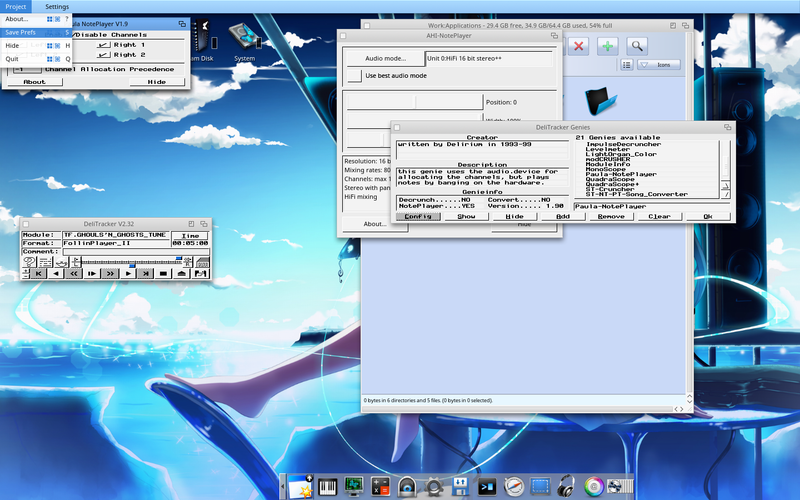 This is part 2 of my build of the recently released MorphOS 3.10 on my Powerbook G4 from scratch. Part 1 is here if you haven't read it already - this part continues straight from Part 1 so I am assuming you read Part 1! The next part of the build is getting AmiNetRadio setup. You can download it from Aminet. To keep things clean on my build, I created an Applications drawer on the Work partition. This means that the core OS parts are kept separate from the stuff I am adding in. This makes it quicker to backup the OS partition before upgrades, etc. 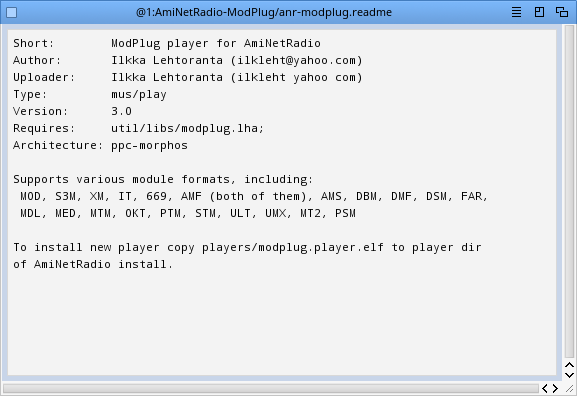 One of the things you will need to do is download all the external players that allow AmiNetRadio to play all the different music formats - here below for example is the ModPlug player archive, which I got from Aminet. 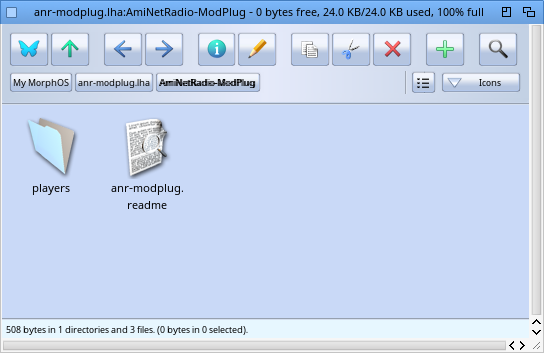 This gives AmiNetRadio the ability to play back a lot of different common Amiga mod formats. 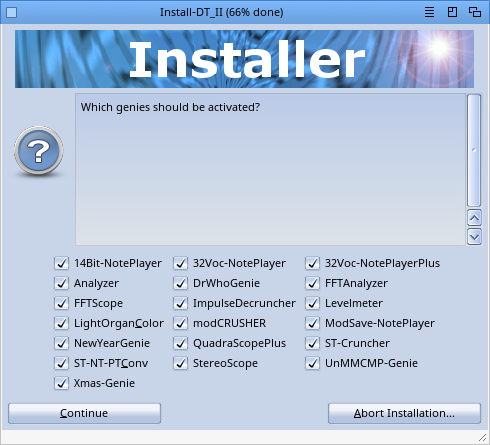 Note that it doesn't play CUStom mod formats, TF format files and a few others too. 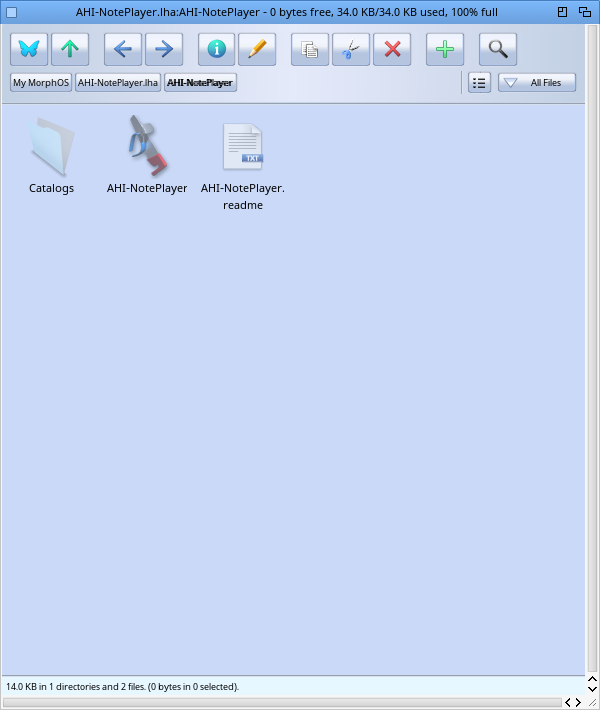 To install you simply copy the contents of the Players drawer (shown below) to the Players drawer in the AmiNetRadio drawer shown in the screenshot above. I next added the FLAC player (as below), and then added all the other ones available on Aminet one at a time. In addition to players, AmiNetRadio also supports skins of the player interface - the default one is seriously ugly in my opinion. Here I have added some more from Aminet. 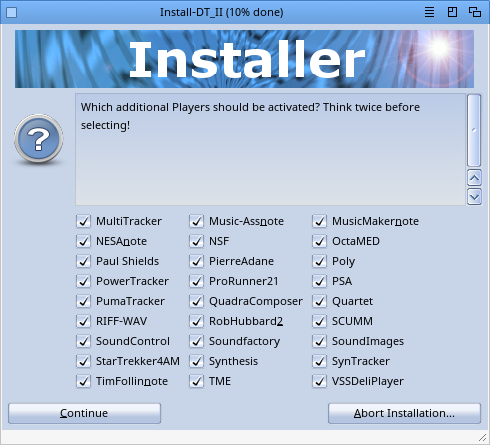 Naturally I want all the custom mod formats - that is why I want Delitracker installed! 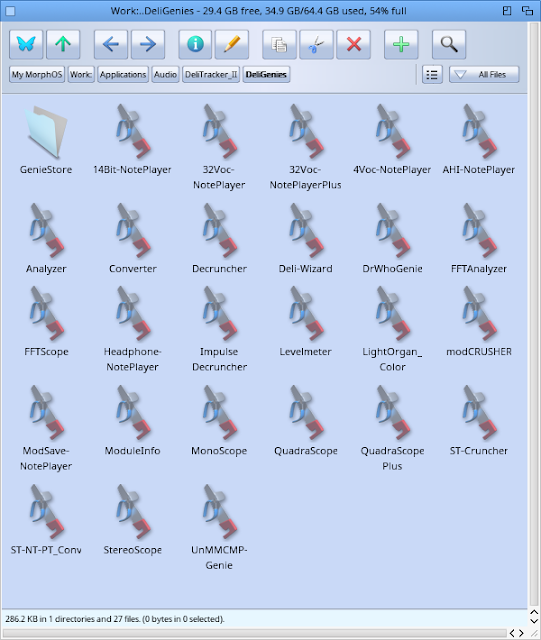 You need to move all the *-*player files to the GenieStore. The AHI-NotePlayer I then move into the DeliGenies drawer shown previously. 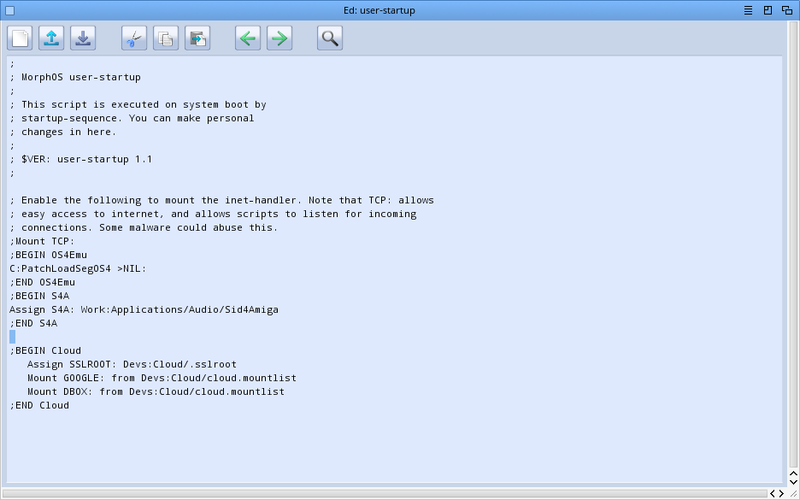 With that I could launch Delitracker II, but we need to do some more configuration before we can use it at all. Do not play any mods with it yet. With the AHI-NotePlayer prefs window in focus, right click on the Ambient Workbench title bar and under Settings menu select the Activate option, and make sure the Popup option in the same menu is deselected. 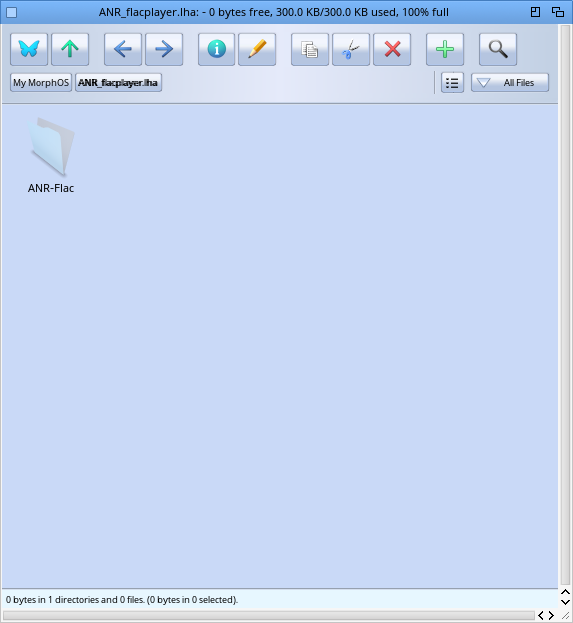 This means that Delitracker will use the AHI Noteplayer. With that done, go back to the same title bar menu by right clicking and select Project > Save Prefs. 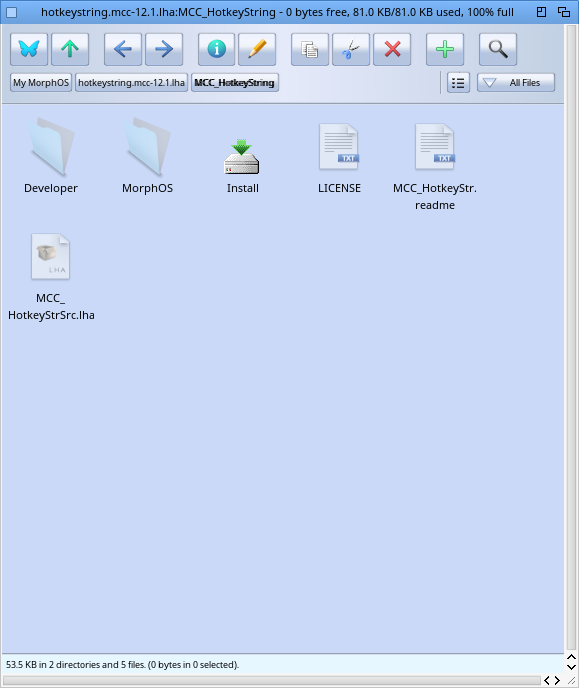 You can then click Hide in the prefs window to hide the prefs window. 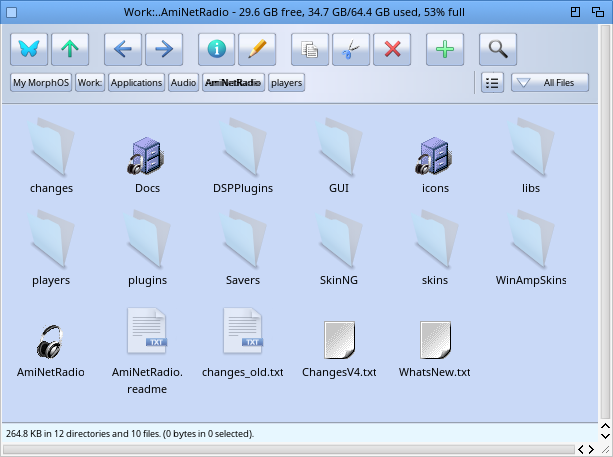 As before with AHI, We need to right click on the Ambient Workbench title bar and access the Settings menu. In this we need to deselect Activate and Popup. 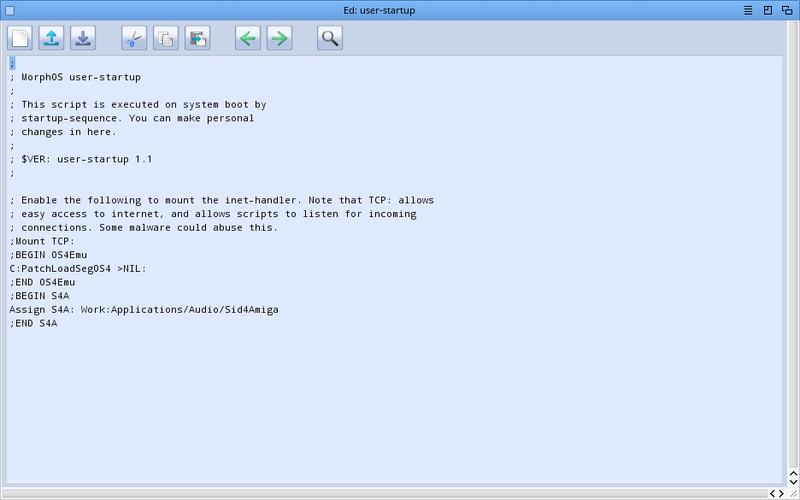 This will ensure the Paula noteplayer is not used by Delitracker II. 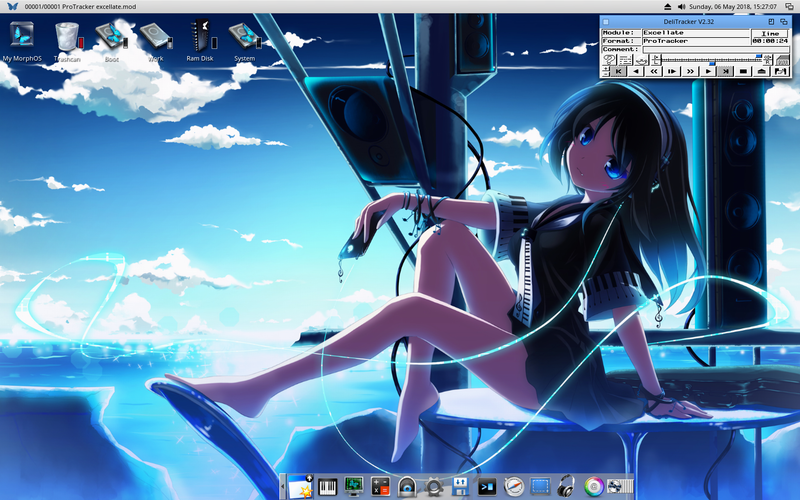 Again, you need to keep the Paula Noteplayer window in focus, then right click on the Ambient weorkbench titlebar and select Project > Save Prefs to save the setting. 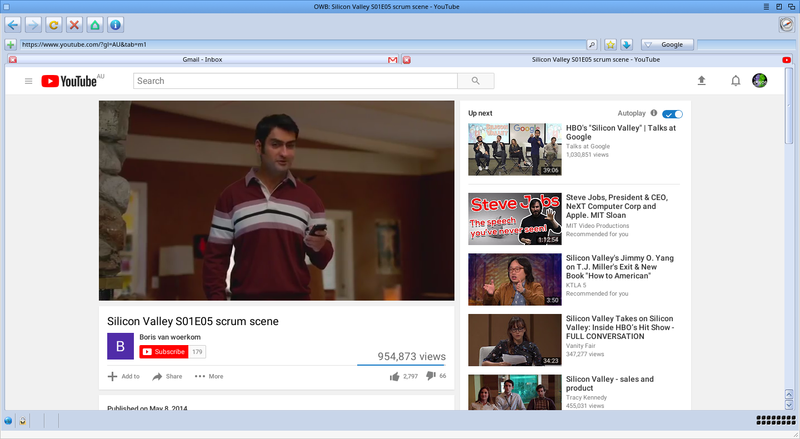 You can then click on Hide in the Paula Noteplayer window. It is not possible to remove the Paula Noteplayer as it is not a file in the DeliGenies drawer that we can remove like the others. 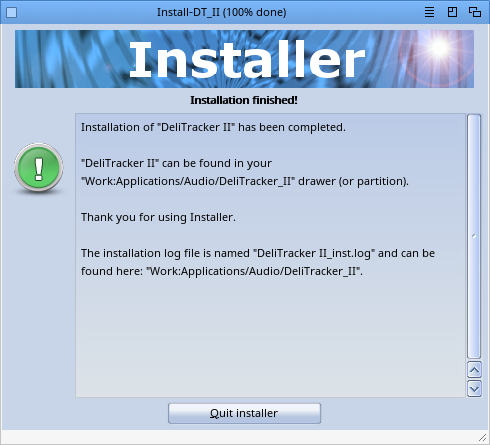 If you try removing it in the DeliGenies prefs then it will just reppear the next time you launch Delitracker II! That is why we need to deactivate it as per the steps above. 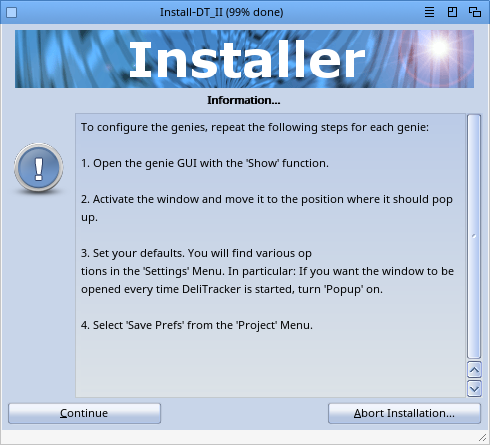 You can now click OK on the Delitracker Genies window. Don't forget to also go into the Delitracker Options (? 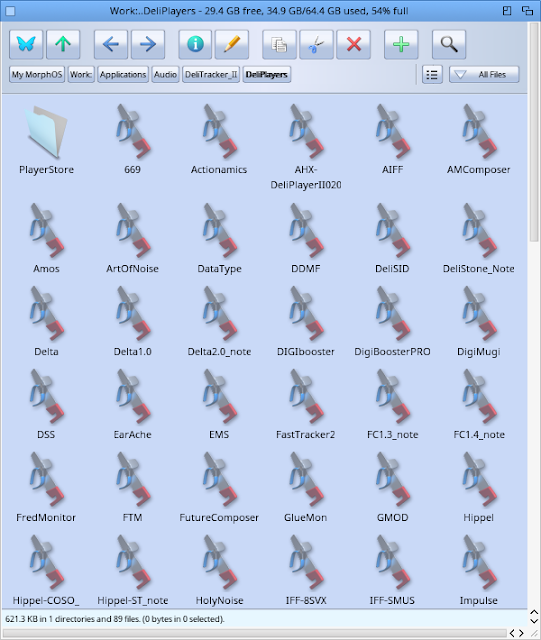 icon) in the Delitracker II program as well as we should enable the Low chipmem option. This forces Delitracker to use Fast memory instead of chip memory, which has to be done since MorphOS has no chip memory hardware installed and we need to use Fast memory. With that done, you need to save the Delitracker preferences to make sure we don't lose all the work we just did! With Delitracker II window in focus, right click on the Ambient title bar menu Select Settings > Save Settings. If prompted accept the default name. 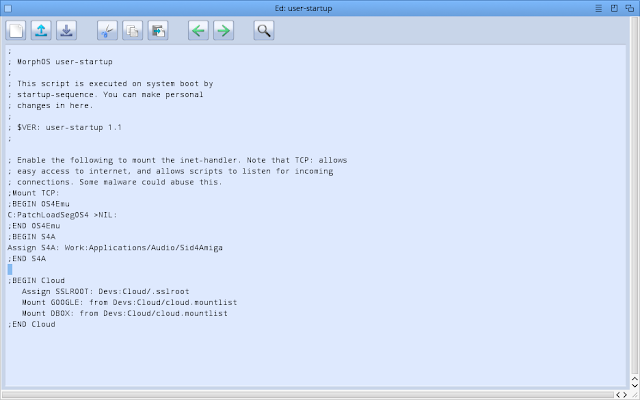 With that you need to close Delitracker, which you can do from the title bar menu Project > Quit. Clicking close on the window will minimise it, not close it! 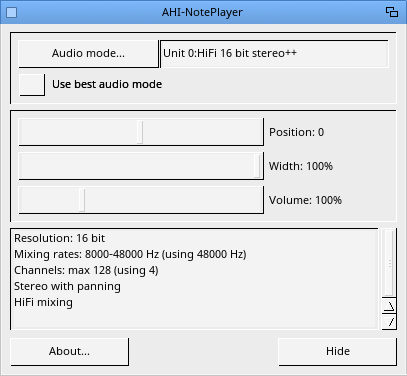 With it relaunched, Delitracker II is now using the AHI Noteplayer instead of Paula and can play most of the custom mod formats that other MorphOS mod players can't playback - which is of course why I was setting this up in the first place! Really great to have this - under AmigaOS4.1 it is far from optimal. 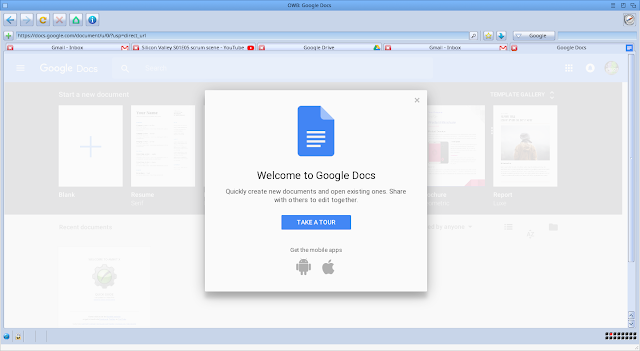 I also decided to try out the Google Apps. This is relevant since most NG Amiga systems have poor application support for Word/Excel/Power point style applications. Being able to run these through a web browser solves this issue since it is not important then to have a local application to edit documents under MorphOS. (I know there is Cinnamon Writer for MorphOS, but it is a long way from being a fully featured word processor). Pleased to say it works well, and I was able to create a new document and save to Google Drive. I had less success with the Google spreadsheet application, which crashed the system trying to launch itself. 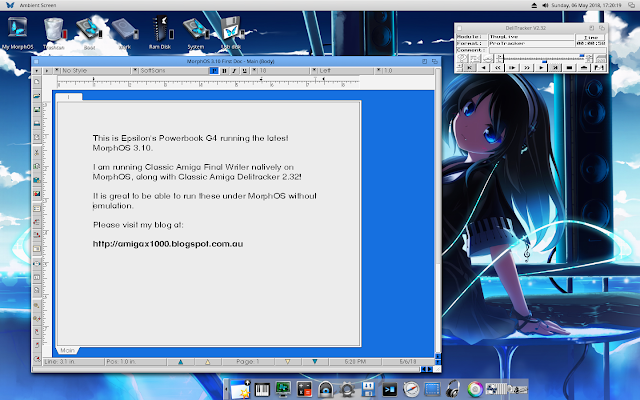 I also had trouble using Google Drive through the web browser, but there is an application for MorphOS to give you access to Google Drive natively through MorphOS. More on that later. Using the browser spoofing function in Odyssey to make it pretend it is a iPad or Chrome/Firefox/IE, etc, really helps with getting sites to load correctly in my testing. 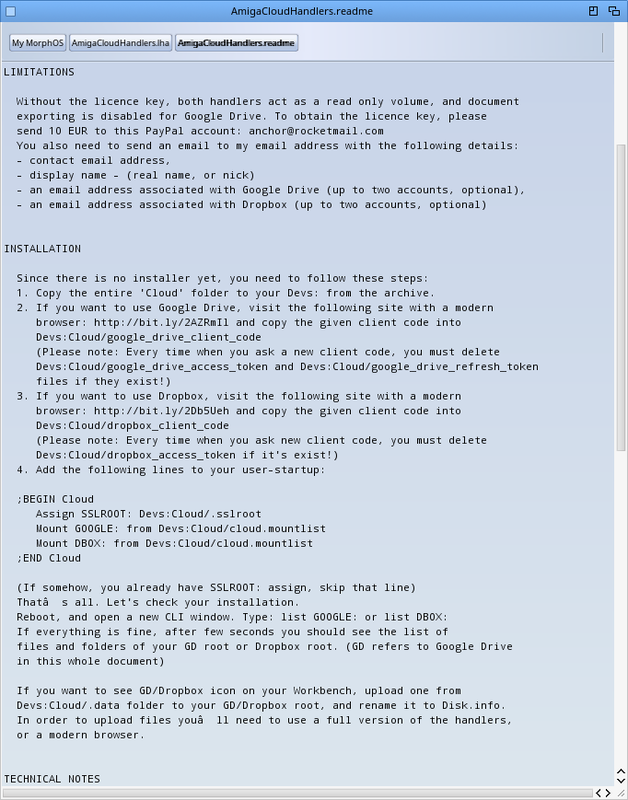 Next up is installing AmigaCloudHandlers, an application written for Classic Amiga, MorphOS and AmigaOS 4.x to allow Amigas to mount Google Drive and Dropbox cloud stored files from a drive mounted on our Amigas! Very cool! I downloaded the latest 2018 version of the program from AmiNet. This program requires registration to use it in reade/write volume mode, but using it in read only volume mode is free to try it out first. Here is the content of the Cloud drawer. As per the installation instructions we need to obtain a code for the Google Drive via the web link provided in the installation instructions. You do of course have to have a Google account to proceed past this point. Since I have one already I put in the web link into Odyssey, logged in with my Google account and soon enough it prompts me to allow the program access to my Google account. 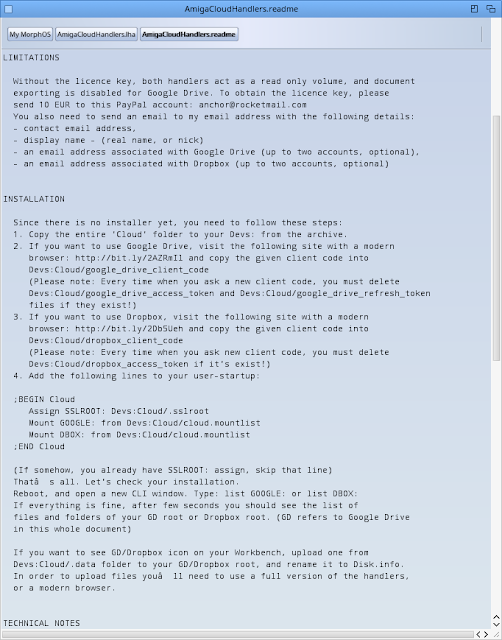 This is needed to allow AmigaCloudHandlers to work with Google Drive. 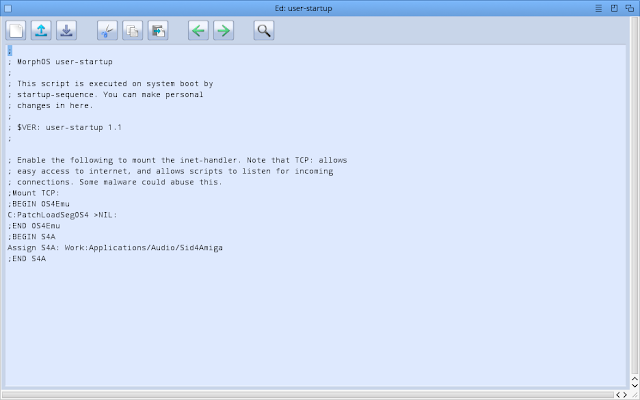 Next we need to modify the s:user-startup file to add the lines indicated in the installation instructions, which I did. I have a Dropbox account also, but for now I decided to focus on getting Google Drive working. After some mucking around, I found the issue. 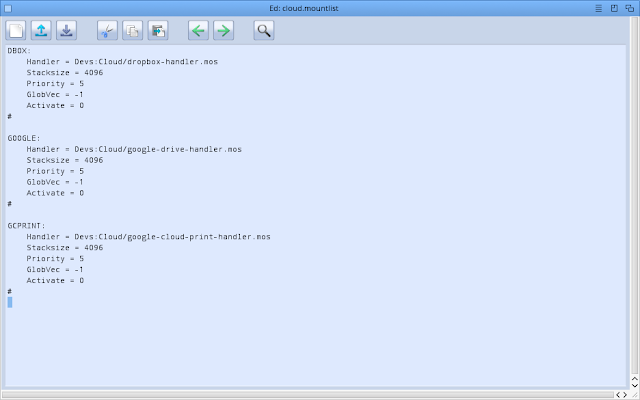 In the Devs:Cloud drawer there is a file called cloud.mountlist. Upon reviewing it I found it is using the 68k version of the handlers rather than the mos (MorphOS) versions! 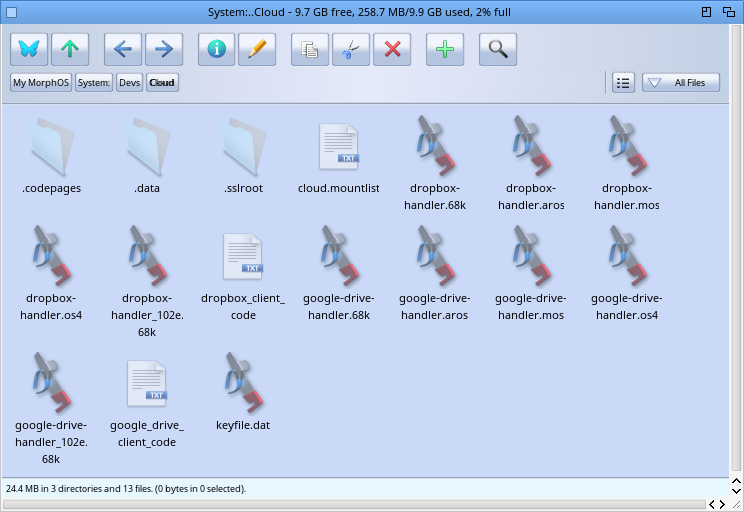 Both versions are in the Cloud drawer but it seems to be default set to use the 68k versions. 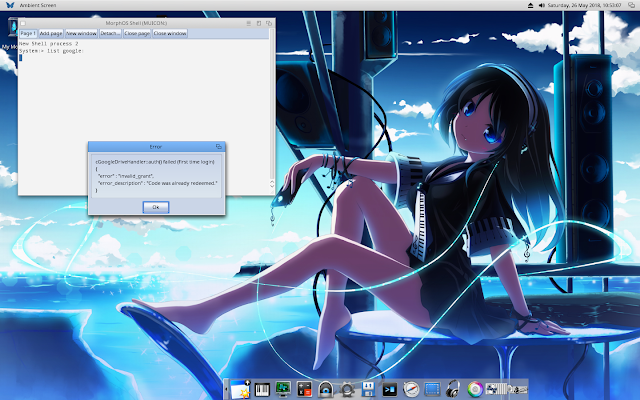 The need to change this for MorphOS (and presumably AmigaOS 4.x too) was not explained in the installation instructions, which in my view it really should have been. It didn't work for me until I changed it. I edited the cloud.mountlist file and changed the three handlers to use the mos versions of the handlers, as below. 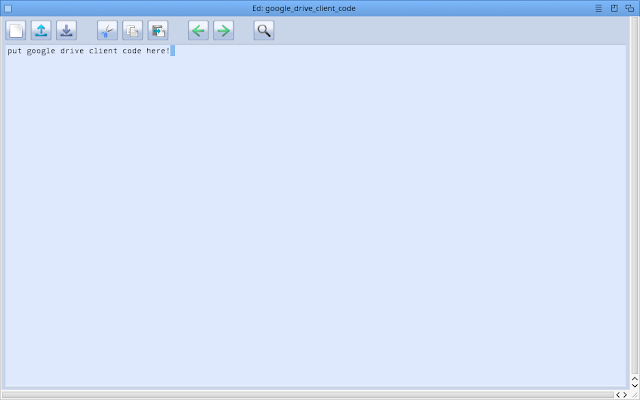 After another reboot, running "list google:" it then mounted and worked first time! Success! With that done, I now have a GoogleDrive icon on MorphOS 3.10, and access to all my Google Drive files at any time directly from MorphOS! Very cool indeed. 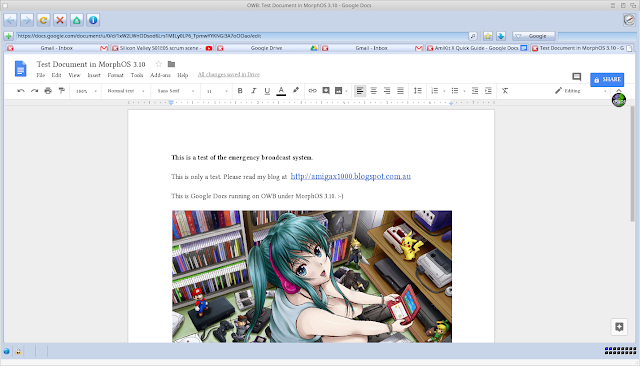 You can even see the Test document I created in Google Docs early in the post and saved to Google Drive! I am really glad to get that working well. 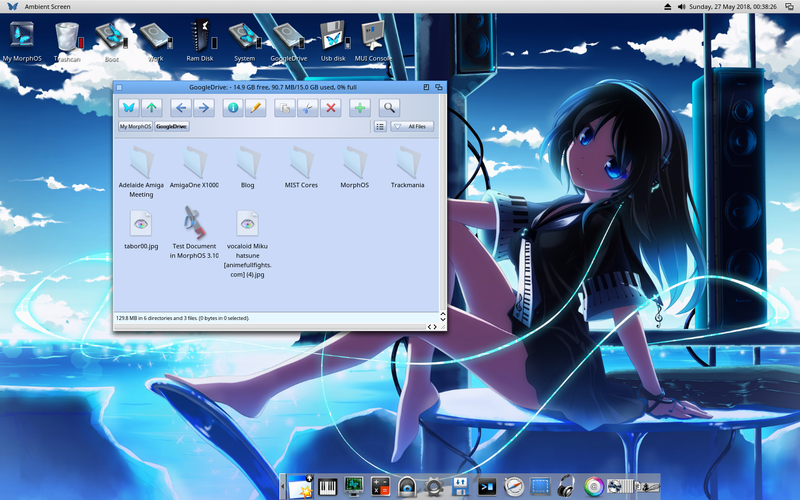 I am thinking to backup my MorphOS system to the cloud storage, putting my mod collection on there, and maybe other things too! 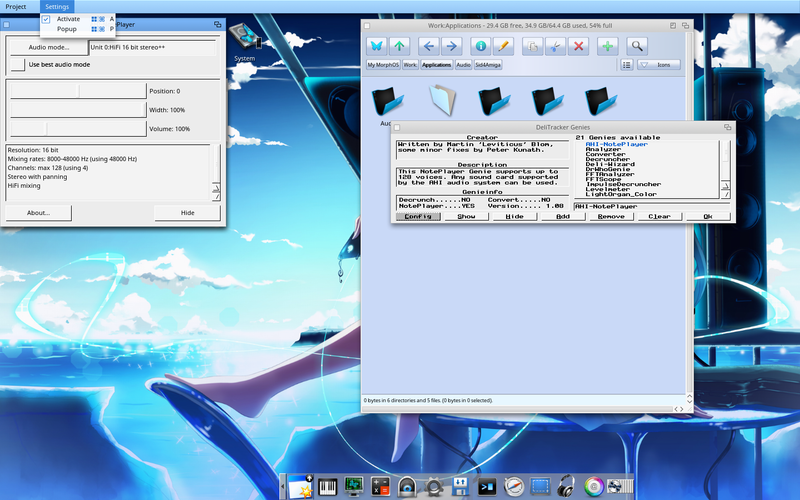 Having an extra 15GB of free internet storage available to my MorphOS machine is very handy, and being able to copy stuff to Google Drive from any machine and being able to immediately access on MorphOS too is rather cool too. 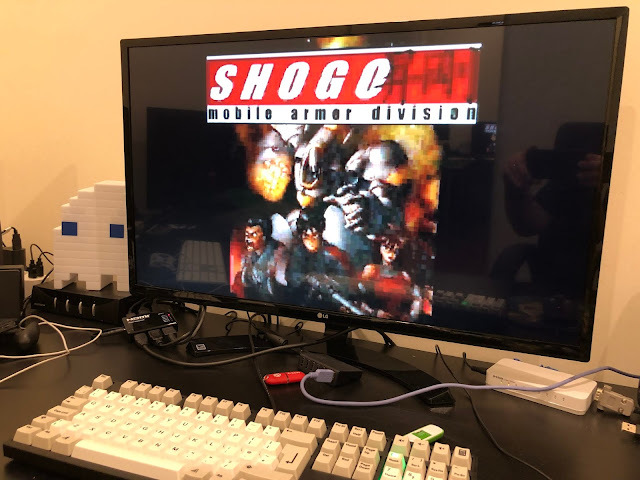 For the next part of the build (when I have time to write it), I plan to work on the Classic Amiga emulation and other things too. Until then, I hope this has been interesting and encouraged you to play around with MorphOS 3.10! 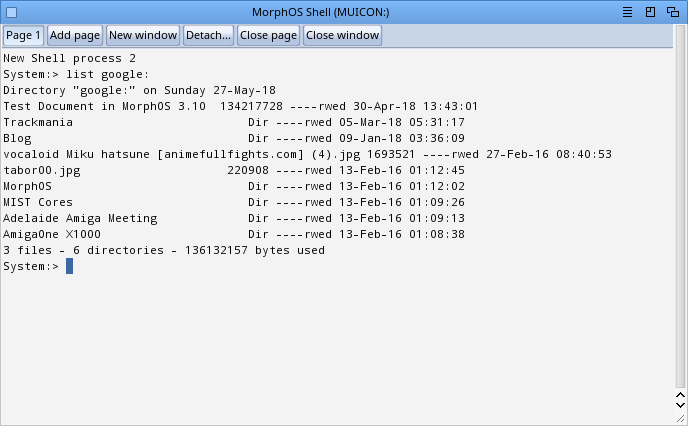 Also you don't mention the excellent MorphOS Storage for many files that are not on Aminet that relate to enhancing and updating MorphOS systems. If you are still considering updating your MorphOS PowerBook for printing - then I'd take a look at either the MorphOS Forums or WArMuP Forums that relate to printing as there is some important information you will probably not be able to print from your printer, especially if it's a USB printer, as v3.10 had the USBPAR: device left out of the installation, and that's the critical file you'll need to get it to work - oh, and while I remember VPDF that came with v3.10 is also flawed, and you'll not be able to print with it as it's got no printer device option, so you must use the earlier VPDF, ideally from v3.9, as that one can be configured to print with - see the forums for more advice, if required. Thanks for the tips and hints! Sorry for the delay approving posts but I have been very busy over the past week. Regarding Folio, I didn’t know about it so thanks for mentioning it - I will try it out soon. Regarding the printing support, thanks for the info about the missing bits in 3.10 - when I try to set it up I will check the forums as suggested.